As time flies by here in Chicago, I continue to see the truth in these seven words. Within my classroom and outside of my classroom, I have experienced growth through new and challenging experiences. I teach at a school that is 68% Asian and this past week has been full of celebration of the Chinese New Year, Year of the Dog. Within the classroom we have been working towards achieving a greater understanding of the Chinese New Year. Through educational videos, work with the Chinese Zodiac Chart, and crafting of dragons, room 222 has been diving in to ensure that all students are connected with the Asian culture. On Valentine’s Day our school started the day with a visit from the dragon in the hall. 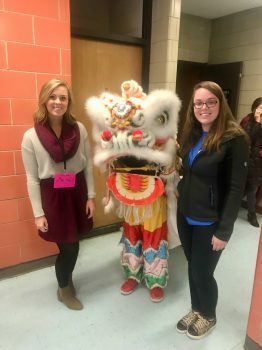 Students, who were wearing traditional Chinese clothing, accompanied the dragon. I saw great pride in my students, as they were engaged and very eager to share different stories after the dragon. Healy Elementary also hosted a family luncheon to celebrate Year of the Dog. During this luncheon, I was able to connect with family members and other school staff. That afternoon there was a school assembly filled with song, folktales, and dance. The assembly began and ended with the dragon. Outside of school, I have continued to explore the city and get accustomed to the area. 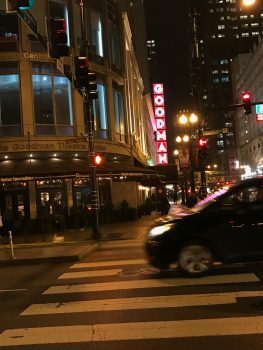 Through Chicago Semester, I went to the Goodman Theatre to see the play, The Wolves. Through the various art events offered through Chicago Semester, students are not only given the chance to explore the beautiful buildings that art events take place in, but also the art event itself. This was a very powerful play, as it showed the reality of what those in high school deal with academically and socially. As a future educator, I found this to be an important play because I will help prepare students for the stresses of secondary education. Along with this experience, I have continued to explore the city through attending a service at the Holy Name Cathedral, visiting the Signature Room on the 96th floor of the John Hancock building, and shopping on Michigan Avenue. My favorite spot to do work has come to be the well-known Starbucks, especially when my friends are able to come and do work with me. However, I also have been challenging myself to find other local coffee shops. 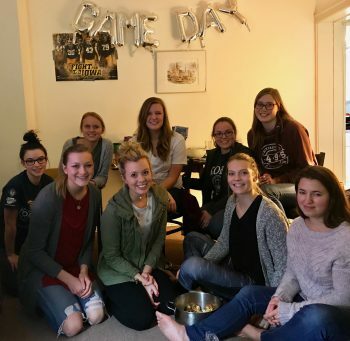 To celebrate the Super Bowl, my friends and I held a Super Bowl party where we all brought a dish to pass and watched the game. As a whole, I am coming to love the city more and more with each experience. As I move forward into the next two weeks, I will be diving in to my teaching through working on my edTPA, a performance assessment that is required for licensure, and taking full control of the classroom. I am greatly looking forward to getting to teach my beautiful, intelligent, and creative 29 students. I am excited to continue crossing more off my bucket list, as the weather begins to bloom with spring hopefully I will continue to bloom also.